Caesar and Xoë learnt to dive with Deep Impact. The year before last, Caesar and Xoë learnt to dive. And ever since then I have wanted to learn too. At the time when my brother and sister learnt to dive, I was only eight. Xoë and Caesar were 14 and 16. They each did several training dives and then they did an exam. They both passed with 100%. Then they were both proper, qualified Open Water Divers and had to be brought all sorts of expensive kit such as wetsuits, flippers, and things called BCDs. Later, Caesar did some more training and another exam, and became an Advanced Open Water Diver. Mummy has always wanted to learn to dive. Even before Caesar was born she wanted to learn, but she was pregnant. After that she was always too busy. When Caesar and Xoë learnt she was very envious, but she said that she couldn’t have lessons at the same time because it was too expensive. Besides, she said, she was too old now! 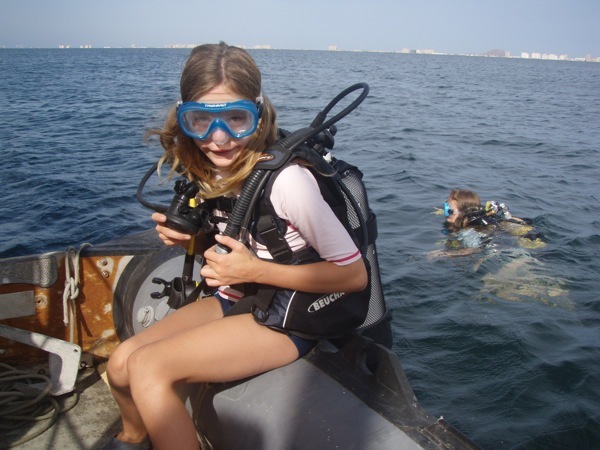 After my eleventh birthday I was old enough to learn to dive, and I wanted to very much. I love to study the animals that live in the sea, but it is difficult to do this when you have to keep coming up for air. You have hardly got to the bottom when you have to go back up again. When Caesar and Xoë learnt to dive they came back telling stories about moray eels and octopuses, and I wanted very much to see these things too. For my eleventh birthday Grand-pa gave me £100, and I decided to put it towards a diving course. Mummy and Daddy said that they would pay for the rest – and this time Mummy decided that she would take the chance before it really was too late, and she would learn to dive as well. 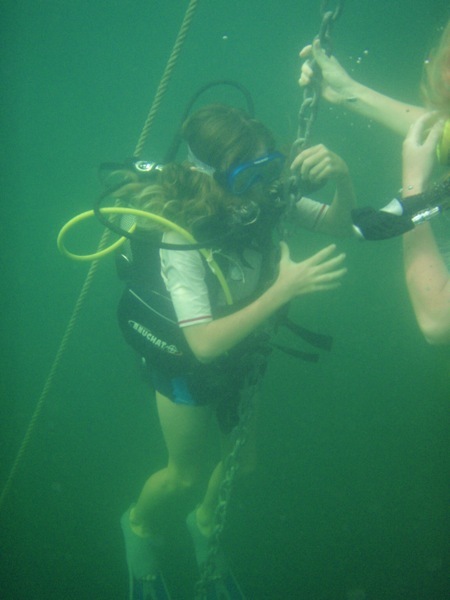 Not every diving school will teach an 11 year old to dive. None of the Spanish schools are allowed to teach children under the age of 15, and even in England you have to be 12. Fortunately we have a German friend, who follows the German diving regulations, and these allow 11 year olds to learn. Our friend’s name is Volker, and his diving school is called Deep Impact. The first dive takes place in the pool. Before you can go diving there is a lot of preparation. 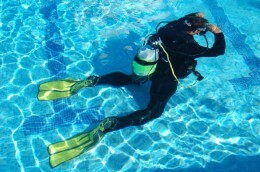 Every diver prepares their own equipment, because it is their life that is going to depend on it. First, Kexi showed us how to strap our bottles of compressed air onto our Buoyancy Control Devices, or BCDs. 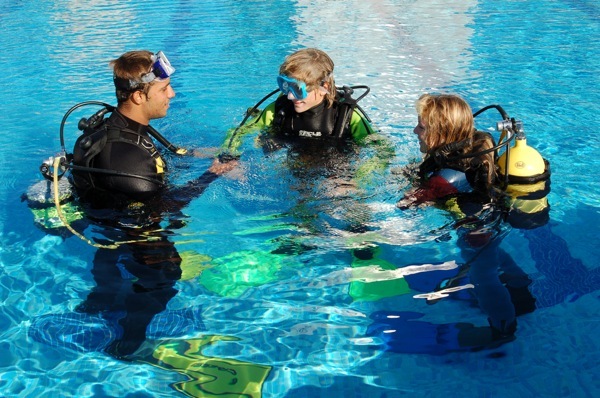 A BCD is an inflatable jacket which you use to control your buoyancy. We also had weight belts, which are just simple webbing belts with blocks of lead threaded onto them. If you don’t have a weight belt then you just stay at the surface, floating. 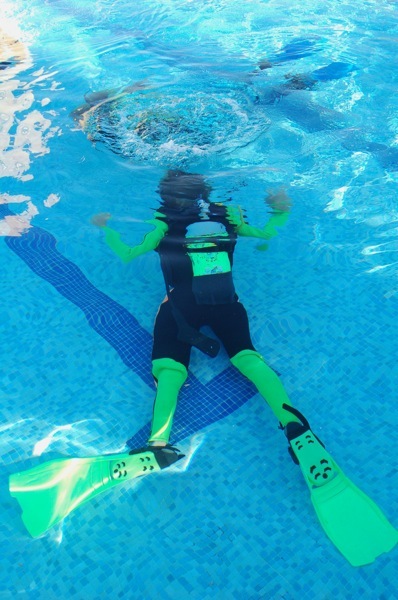 You use the BCD to counteract the weight belt. When you want to float effortlessly at the surface you let some air from your bottle into the BCD, and it inflates and holds you up like a lifejacket. When you want to go down, you let out some of the air. Before we put on our BCDs we had to attach the regulators. Regulators regulate the flow of air from the bottle. On the end of the regulator hose there is a mouth-piece, and before we got into the water we breathed through the mouth-piece to make sure that the air was coming alright. Now we were wearing all of our gear, and it was very heavy. In fact, it was so heavy that I fell over and couldn’t get up again! Mummy and Kexi couldn’t bend down to me, or they would have fallen over too, so a woman who was sunbathing came and helped me. Every time you go diving you are supposed to have a “buddy”. This is someone who stays with you all of the time. You must never be more than an arm’s length apart. This is because of the risk that you might have a problem. For example, if your regulator stopped working, then you would obviously need help, and you would need it very quickly. Every diver has two mouth-pieces as part of his regulator, and the spare one is the one your buddy breathes from when something goes wrong with his regulator, or if he runs out of air. (The spare regulator is called an octopus – although really, it is the whole thing, with all those air lines coming from it, that looks a bit like an octopus.) Caesar once had to use his buddy’s regulator, because they got lost and while they were trying to find the boat he nearly ran out of air. He did not tell us about it until months afterwards, because he knew Mummy would be alarmed. We had to practice removing our masks underwater. “Down” signalled Kexi, with her thumb, and she let the air out of her BCD. We copied her, and down we went – all the way down to the bottom of the shallow end of the hotel swimming pool. We had lots of things to learn. One of the first things was how to clear your mask of water. You need to know how to do this, because you are swimming so close to the other divers that sometimes your mask gets kicked off by your buddy’s flipper. Mummy was not very good at clearing her mask. You are supposed to lift the lower edge of the mask, lean your head back, and blow out through your nose, but Mummy blew out for so long that she ended up accidentally breathing in too… and so she got a nose full of water and water in her lungs! She was choking so much that she signalled, “Up”, and went up, but Kexi said that if it happened again she must stay down and cough into the regulator. 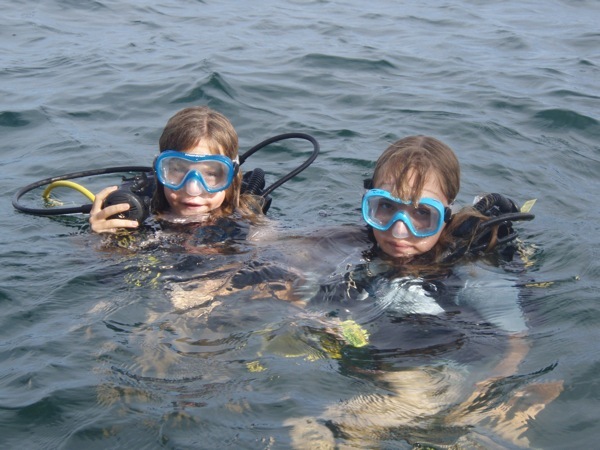 After that, Mummy hated clearing her mask of water – and so Kexi made us do it at least once every time we dived, so that she would get used to doing it. So while Kexi fetched the van and put away all of our diving gear, we had a nice relaxing swim. The next dive was in the Mar Menor, around Mollymawk. Volker came and tied his big, new RIB alongside, and while we got on with our lesson he and Daddy got on with some beer drinking. We climbed into the RIB and we sat on the side of the boat and put on all of our heavy gear and our flippers. We tested everything, and then we inflated our BCDs. “Now, roll backwards,” said Volker. So saying, she leant backwards and plummeted heavily into the water, landing on her shoulders and her head. “Go on. You next,” said Volker, pushing me off the boat. I crashed backwards into the water and turned a complete somersault before my BCD brought me quickly back up to the surface. I suppose I wasn’t holding onto my gauges, because they were all over the place. Mummy dropped in beside me, with her arms outspread and a rather frightened look on her face. Mummy hates falling backwards. Descending beside the anchor chain. We swam to the anchor chain and descended beside it. This was so that we could know how fast we were descending. Then we swam around on the bottom, five metres down (about 17 feet). Kexi made us take our masks off and put them on again and clear them. Mummy and I were both having a lot of trouble controlling our buoyancy. If you let all the air out of the BCD then you sink to the bottom, and Mummy spent a bit of time churning up the mud down there. My problem was exactly the opposite. I kept floating up to the surface. Just a tiny change in the amount of air in the BCD makes all the difference. After our third or fourth accidental ascent Kexi said that we had done enough for one day, and we got out of the water. The next morning, Volker and Kexi arrived to fetch us in the RIB. There were some other divers in the boat today, but none of them were beginners. They were going off by themselves, and Volker invited Caesar and Xoë to go with them. He is very generous. 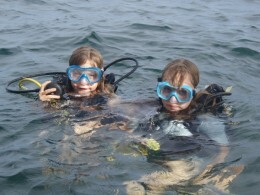 He had brought bottles of air for them, and he lent Xoë a regulator and a BCD, because Mummy was using hers. 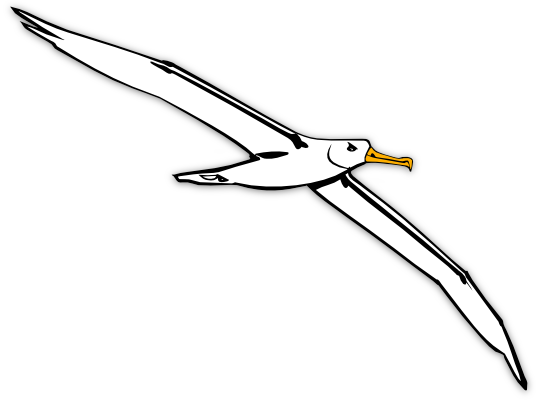 We all clambered aboard, and Volker turned the boat around and shot off through the canal which leads to the open sea. While we tore along, Kexi was trying to tell us about our dive. Caesar says that Volker doesn’t approve of pre-dive briefings, so he just blasted along, crashing over the waves at forty knots. “We will do the mask exercise again,” said Kexi. “Just because you know I hate it,” Mummy said. “Yes, of course. If you hate it we must do it lots of times,” Kexi agreed. We were diving at Farallon (Fa-ra-yon) which is a great big rock rising up out of the sea. There is a hole right through it, but you can’t swim through the hole because it is much too shallow. It looked very odd as we approached: a great big rock archway rising up out of the sea all by itself. We put on our kit and we rolled into the sea. This time we managed it better than before. Down we went, beside the anchor chain. This time we went down to 9 metres (about 30 feet). The pressure is twice as much, down there, as it is on the surface and I had a bit of trouble sorting out my ears. If you get air trapped inside your ears it hurts, so as you descend you have to wiggle your nose and swallow and blow, to get the air to come out. Mummy is very lucky: she forgot to do anything about her ears, but the air came out anyway. Roxanne and her sister prepare to descend. Swimming in the Mediterranean was like being in an enormous aquarium. I never expected there to be so many fish! There were little shoals of hundreds of bright blue fish – as tiny as a grain of rice but brilliantly blue. There were shoals of little black fish. There were shoals of big, silver salpa, looking even bigger because the water magnifies everything. The salpa looked very strange grazing in a herd on the posidonia sea grass. The bottom of the sea was carelessly scattered with bright orange starfish as big as my hand, and there were spiky black sea urchins in every crack and hollow. There was an octopus watching us from his hiding place. Half of it was jammed under a rock and the other half was so well camouflaged that I nearly swam straight past it. I saw a bright red sea squirt. I saw a big, pale green anemone which looks like a kind of plant, its tentacles are so long. I saw dozens of pen shells, which are shaped like a tall, thin fan, standing upright on the seabed. When I touched one gently, it closed up. There were all sorts of wonderful things, and now that I had a tank of air on my back I could stop and look at them – but not today, because today I had to practice controlling my buoyancy, and watching my air gauges, and lots of other things. After we had been following her around for about half an hour Kexi stopped. She smiled at Mummy. Then she took off her mask and put it on again and cleared it of water. She pointed at me, and I had to do the same, and then it was Mummy’s turn. Mummy rolled her eyes and made a horrible face, but she did it. Then we swam back to the anchor chain and made a careful ascent. We had managed our buoyancy a bit better this time, so we were a bit happier. Our next two dives were at Isla Grosa, which is the island just outside the entrance to the Mar Menor. This time I was wearing a thicker wetsuit and I didn’t have enough weight. I couldn’t get down! Kexi came back up and pulled me down. Once you are on the bottom it is easy to stay down, it is only the first metre or two that is difficult. We swam around again, seeing hundreds and thousands of fish. There really are a lot of them down there! There were fish with whiskers, which I recognised as striped red mullet, and fish with an orange stripe, which Kexi afterwards said are called wrasse. There was a huge cloud of salpa just hanging around, doing nothing. We had noticed, before we dived, that there were lots of people fishing from their boats, and we were amused to see that they were all fishing in exactly the wrong place. Kexi made us check our gauges and signal how much air we had left, and then, eventually, we went back to the anchor chain and we practised ascending, arm in arm, using each other’s spare breathing apparatus. Then we swam around some more, and afterwards we both did a very slow, careful ascent – even more slowly than Kexi – and she was pleased with us. This meant that we had just two days to finish reading the diving manual and learn it all by heart. Roxanne is now a qualified diver. a) It is naturally aggressive, like a bully. b) You have provoked it. It was the first exam I have ever taken, so I was very pleased when Kexi told us we had both got 100%. So now there are four fully qualified PADI Open Water Divers aboard Mollymawk, and Daddy will have four people to clear the propeller when he sails over a net. And now we need two more sets of expensive diving equipment! Roxanne is the only one of our ship’s company who can claim that she was actually born aboard a yacht. She can also claim to be the youngest sailor amongst us, having made her first channel crossing (from England to France) at two weeks of age. Her first birthday was spent a few days out from Cape Town, and her fifth one day out from the South Atlantic island of St Helena. Two of Roxanne's first three years were spent living on a farm and her early interest in everything from earwigs to ostriches formed the foundation of her passion for wildlife. At the age of eight Roxanne won first prize in the RSPB’s Nature Diary competition in the 8 – 12 year olds category, and a couple of years afterwards she was asked to write an article for their junior magazine. 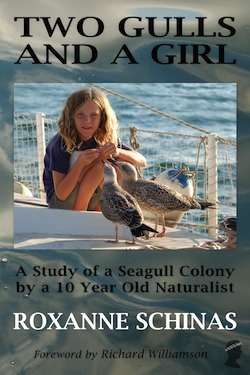 At ten she made an extensive study of a seagull colony, hand-reared two baby gulls, and wrote a book about the adventure. Two Gulls and a Girl is published by Imperator and is available via this website or from Amazon UK or Amazon US. Very good. I will make sure Alex reads this, too. I just love reading everything from the Mollymawkers…. Well done Roxanne and Jill…!